Cruising is fast taking over the travel world, with more and more realising the benefits and appeal of the type of travelling. How you can wake up each day to a new destination, enjoy sheer luxury and have a vast range of such unforgettable experiences. Virgin is the newest brand to be heading to the waters and today announced the name of its inaugural cruise ship – Virgin Voyages Scarlet Lady. Sir Richard this week announced the launch of adults-only cruises, marketed entirely at young professionals. To be named Virgin Voyages and due to launch in 2020 the cruises will be strictly over 18s and “adult by design” with a focus on things that will appeal to a younger crowd. 93% of the cabins are set to have an ocean view and 86% a balcony – a change from many cruise ships where there are a deal of indoor cabins. The interiors are set to be more lifestyle focused and contemporary, curated by designers who have worked on the Ace Hotel chain and Virgin Atlantic Upper Class. Virgin Voyages are building three ships from scratch, though the Scarlet Lady is the first to have been given its name. The name itself is no surprise to followers of Branson’s global empire, as it also appeared on one of the first planes to fly for Virgin Atlantic. 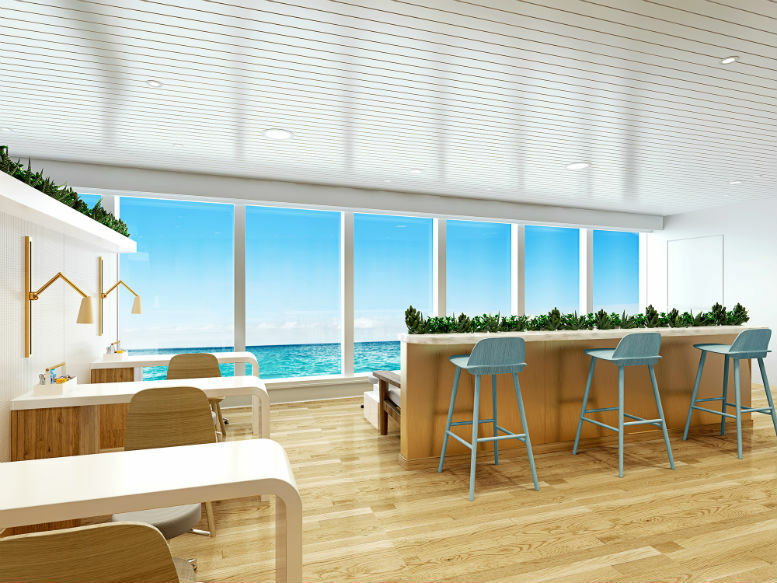 There will be a focus on wellbeing on Virgin Voyages Scarlet Lady, with a Crows Nest that not only offers a 360-degree view, but also a spot for secluded sunrise and sunset yoga. There will be a Virgin red running track, outdoor training zone with boxing ring, strength and gym equipment, bike rooms, MyBeast, an artistic adult playground and fitness apparatus, will add a Venice Beach-like atmosphere to the pool. At night you can attend evening spa parties and to get pampered you can head to the standalone dry bar, barbershop and mani-pedi spa. It was also announced that a ‘Scarlet Squad’ programme will aim to recruit, support and mentor female shipboard staff, with opportunities to rise to leadership roles in such areas as marine, technical and hotel management which typically have low numbers of women bosses. Virgin Voyages Scarlet Lady, which will sport the brand’s mermaid image, will set sail from Miami in 2020, followed by her sister ship a year later. More details of the features and experiences will be revealed throughout the year, with the first voyages expected to go on sale by the end of 2018. Sign up to their mailing list and keep up to date with Virgin Voyages Scarlet Lady & other news here.